This simple recipe is a healthy, gluten-free and delicious easy-to-make snack! • Bring the water to a boil and add the millet and the pinch of sea salt. • Cover the pot and bring to a simmer for 20 minutes or until all the water has been absorbed (about 15 if you pre-soaked the grain in the water). • Stir in the herbs and spread the mixture evenly in a baking dish. 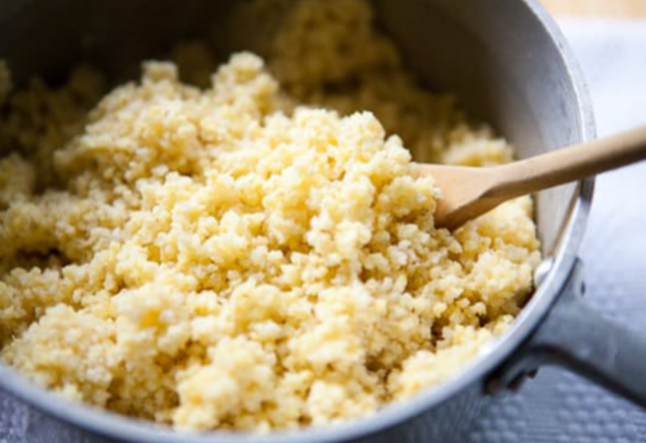 • After cooling, cut millet into squares. For some added flavor, you can briefly fry the squares with a dash of olive oil. Top the squares with avocado and lemon rind, a drizzle of nomato topping and serve at your next dinner party! 2 1/2 cup of water. 1/4 cup of "Herbs of Provence"